Peterboro Basket Company of Peterborough, N.H.
Part 24 in an ongoing series highlighting Northeast-based gear companies. Peterboro Basket Company uses white ash harvested in Maine, New Hampshire, and Vermont to produce a vast array of baskets designed to meet nearly every basket need you can imagine, and then some. For more than 150 years, this small family-owned and operated business has specialized in high quality baskets.Today their product selection includes everything from classic picnic baskets to laundry baskets, countertop baskets to storage baskets, as well as baskets designed for more specific needs such as pie baskets, walker/wheelchair baskets, and wedding baskets. 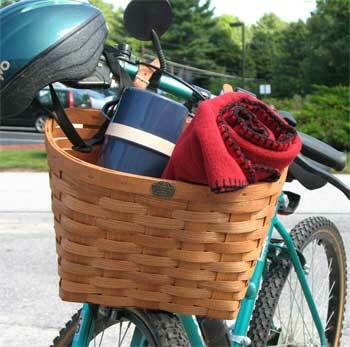 From an outdoor gear (and cycling enthusiast’s) perspective, I particularly like their equally classic line of bicycle baskets—including the large size (pictured)—which have proven to be one of the company’s best-selling categories since it was introduced two years ago. Peterboro baskets are handcrafted and made to order at the company’s factory in Peterborough, yet they remain very reasonably priced given their local sourcing and workmanship, with many styles falling in the $30 to $60 range. You can buy Peterboro baskets directly from the company web site, or visit the factory outlet store in Peterborough.